A little scipt for removing retimers from scene, because they cause huuuuuuuuuge performance slowdown. Hello, it's a simple script which make life easier for game-dev 3d artists. -Clean several UV channels "From: N-channel To: N-channel"
Usefull tool for antiNURBS modeling technique. It can chamfer whenever other vertices or edges on the way, the script will eat them all and you'll nice and clean regular geometry along the edge. 1. Select ONLY ONE edge loop of one EditablePoly object. When you've done, run the script and adjust a radius of a chamfer. 2.Then press OK and get the result. If you customize your UI a bit and have installed the "3dsMax 2011 Subscription Advantage Pack" or the NVidia PhysX utility for 3dsMax, you should notice that it adds menus to the Customize Dialog every time you run 3dsMax. In a month or so, you will probably have to scroll over a thousand duplicates in the Customize Menus Dialog. 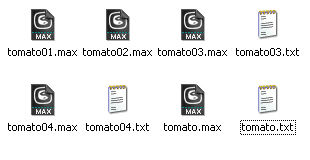 I had a quick look in the PhysX MaxScript files, but I don't want to mess with it. Instead, I made this simple script, that will remove all PhysX menus when 3dsMax shuts down. Don't worry, they'll be added again next time you start.